When I wrote about the future of air travel last weekend and predicted that it would soon fail to meet California's intercity travel needs, I was making an analytical prediction based on a range of long-term factors. Little did I know that intercity air travel is right now facing major strains here in the state. In the comments to that post the "other Robert" pointed me to an article from the LA Times business section last week on United Airlines' growing financial losses. UAL also said it would cut capacity by 9% this year, on top of a 5% reduction in the fourth quarter of 2007, and remove as many as 15 more narrow-body aircraft from its operating fleet, for a total of 30 grounded planes. Heavily traveled "shuttle" markets, such as L.A.-San Francisco and New York-Washington are prime targets for schedule cuts, analysts said. Truth be told, I didn't expect to see this for a couple of years, but here we are. United is one of the major carriers on the LA-SF shuttle route, along with Southwest. If United has to make cuts on that route, it's going to provide reduced travel options and will make it easier for Southwest to raise their own fares. More importantly, it raises the fundamental question of whether airlines will be able to serve the needs of Californians who wish to travel between the two halves of our state. As I noted over the weekend, I'm not predicting air travel will vanish anytime soon, and there will be carriers flying the LA-SF shuttle route for many years to come. But if their service options are reduced and their fares rise (and trust me, this is but the beginning of airline fare increases) then California is going to need another method to provide rapid travel between LA and SF. Numerous critics of HSR point to "cheap Southwest fares" as a reason we don't need HSR. This article ought to suggest that reason is losing what little validity it had, and losing it fast. California cannot afford to watch the airline industry collapse without an alternative plan already under construction. High speed rail is that alternative. As requested by tony d. in the comments to the last post, here is a 3D animation of what Diridon Station and downtown San José might look like when the high speed rail system is completed. Some disclaimers are necessary - this is merely one possible configuration, the new downtown construction is conjecture (none of the new buildings are specific proposals and any new development has to be approved by the city of San José), and it's intended as a conceptual vision instead of a hard prediction. I laughed when I saw the BART station - that's never going to happen - but overall it's a good way to start thinking about the positive impact of HSR on cities like San José. The animation is produced by Newlands & Company for the CHSRA, and they've done similar animations for locations across the state - the Sacramento HSR animation is especially popular on the CAHSR Facebook group, and other videos include the SF Transbay Terminal, the Pacheco Pass, the Tehachapi Mountains, I-5 in the San Fernando Valley, and Anaheim. A representative from the California High Speed Rail Authority will be there, as well as some professors from the UC Davis Department of Environmental Science and Policy. It is open to the public. The goal is to hold similar forums at campuses around the state in the coming weeks and months, and we'll announce those here as the plans are finalized. It's not strictly HSR, but it's a Saturday night, so indulge me. Organizers have chartered an Amtrak express train from LA to Indio for the Coachella festival, offering free rides for concertgoers to and from Union Station. The LA Times described it as "a decidedly 21st century remix of the classic concert road trip and, more than that, a symbol of the gathering new momentum of the festival as a pop-culture force." Though the article focuses more on the growth of music festivals than the train, the train itself is worth some further comment. It's a brilliant idea for the festival organizers, helping provide a safer and greener form of transportation out to the desert. And it's damn useful for helping show more Californians just how useful rail travel is. All those riders will come back to LA from their weekend out at Coachella and, after reminiscing about how awesome Prince and Rilo Kiley were, they'll likely talk about how great it was to take a train to and from the festival. The value of rail travel can seem abstract to those who have never experienced it. For me it was a trip from Madrid to Sevilla on the AVE in 2001 that showed me how transformative HSR could be for a society. Once you get someone on those trains, it shows them that it is a perfectly workable and even desirable method of travel. Of course, folks also point out the shortcomings of rail, from infrequent service to slow trains. High speed rail would solve both those issues as well as many others, making intercity rail travel in California the preferred, most sensible form of travel. The more people who use trains, the more they'll see the need and value of HSR. Maybe what we need is some outreach on the Coachella Express. Anyone reading us down in SoCal who has a free afternoon and feels like handing out some fliers?! I love flying. How could I not? It's in my blood. I have logged a few hours behind the yoke, up in my grandfather's 1949 Beechcraft Bonanza, and spent many more hours as a passenger in that plane watching the land shrink from thousands of feet in the air. Working in the airlines is almost a family tradition - the same grandfather flew 747s for TWA during the height of the Jet Age, several uncles worked in charter service, and a few of my aunts have, at one time or another, worked as flight attendants on the major US carriers. So it is not with any particular pleasure that I watch the slow collapse of the American airline industry. Soaring fuel prices are squeezing the airlines into crisis - four smaller carriers declared bankruptcy in recent weeks, and the Delta-Northwest merger, brought on by rising fuel costs, may be followed by mergers of the other major carriers such as American, United, Continental, or US Airways. Delta and Northwest's CEOs are calling on all airlines to raise fees by as much as 20%. The airline industry has been in varying forms of crisis for 30 years now, ever since it was deregulated in 1978. The low point came in 2001 when the US Congress approved a $15 billion bailout of the airlines - funny how the usual suspects never complain about those kinds of "subsidies." While that infusion was expected to help keep the airlines in business for many years to come, the unending increase in fuel costs is going to threaten their survival. Merge or die is not a sign of a healthy industry. Fuel costs are not going to come down anytime soon - if ever. The current spike may continue or ease, but the underlying factors suggest long-term increases. Global demand is soaring, whereas supply is inelastic and many key oil fields are in decline. These factors alone suggest that the airline industry's troubles are only just beginning. Soaring fuel costs WILL eventually eliminate the cheap fares that so many anti-rail folks use to argue against high speed rail. 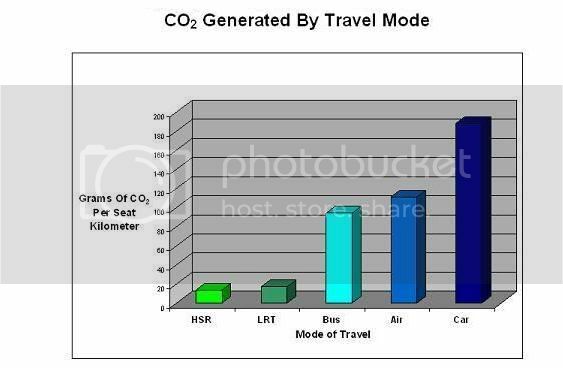 Those low fares are not tenable in the face of permanently high fuel costs - especially when you also consider that by 2020 there will surely be some form of carbon tax or cap-and-trade induced carbon fees tacked on to those fares. The high fuel costs cascade throughout the system. Less money is spent on maintenance and training - the recent grounding for inspection of hundreds of American Airlines planes was the result of deferred maintenance and sweetheart deals made between a captive FAA and the stressed carriers in 2003. Some airlines look to technology to save them, but Boeing's 787 Dreamliner, designed to be more fuel efficient, has been facing a steady stream of delays and angry customers. LAX: Also no room for expansion, with powerful NIMBYs on one side, existing development on two others, and the Pacific Ocean on the fourth. LAX expansion plans have come and gone for over 20 years, and LA World Airports is now focusing on outsourcing growth to Palmdale and Ontario - which would be served by, you guessed it, high speed rail. SNA: Also known as Orange County/John Wayne, this airport is forever limited to 14 gates and one runway, with development on three sides, the 73 freeway and some of California's wealthiest homeowners on the fourth. Plans to build a new, larger airport at the former El Toro MCAS were thoroughly killed in the late 1990s. SAN: Like the others, San Diego Airport/Lindbergh Field has no room for expansion, with development on three sides and San Diego Bay on the fourth. Like Orange County, plans for a new and much larger facility, at the Miramar MCAS, appear to be dead. Even if these problems could somehow be overcome, the cost of airport expansion is estimated by the CHSRA to be well over $40 billion - for a transportation system facing a fundamental and ongoing crisis. Spending billions on airport expansion would be like giving millions in subsidies to the horse and buggy industry in the early 20th century. Air travel isn't going away anytime soon. But neither will it remain the backbone of intrastate travel in California for much longer. It will simply become unaffordable to the passenger, and the airlines will have trouble maintaining operations. Air travel will continue to carry most passengers across the oceans and across the continents (though a significant investment in Amtrak would help make cross-country rail travel a more useful option again), but within California, it is hard to see how air travel is going to be cheaper or more effective than high speed rail between our major cities. For my grandfather's generation, as young adults in the late 1940s, it made sense to view air travel as the future of American transportation. But for our generation, here in the late 2000s, it seems clear we would be nuts to make the same assumptions. Our future will be a high speed rail future. It's time we got started on building that future. John Addison publishes the Clean Fleet Report, a newsletter devoted to renewable automobiles. For Earth Day 2008 he wrote an excellent overview of the California high speed rail project that not only reinforces many of the major points in favor of high speed rail, but does so in a particularly clear and convincing manner. Fiona Ma was nervous about getting on a train that was about to set a world speed record. Just before Easter 2007 in the countryside outside Paris, she saw the people lining the green and flowered route. The French were flying flags, waving, and cheering. Less reassuring were those of faith who crossed themselves as the new train accelerated past 200 miles per hour. The people blurred into a collage of spring time colors. The train vibrated much as when a jet plane roars down the runway and starts to ascend. Fiona hoped that this train would not leave the tracks. At three hundred miles per hour, the train was still on the tracks, accelerating. Out the window, only one image was distinct. A plane that was filming the historic event flew along side the train. Surrealistically, Fiona and the eleven other dignitaries could see what was filmed from the plane on a screen inside the train. Another LCD displayed their world record - 357 miles per hour on a train. Everyone cheered. The train slowed over the next few miles. Fiona took a deep breath, exhaled, and smiled; she took part in history. It's a great framing device for Addison's article, especially as it mirrors some of the initial hesitancy that some Californians have about the project. By now we should be familiar with most of them - it's going to cost too much, Californians won't ride it, the budget deficit means we can't do it, construction will hurt the environment. These are the usual doubts and worries folks have before embarking on a major, transformative project. But once we look at how HSR works in practice - and once we evaluate the specific proposal - it is impossible to avoid having the same feelings of excitement and confidence that Fiona Ma felt on that train in France last year. As a manager covering several states, I used to travel weekly on airplanes. Point-to-point always required at least four hours to get to the airport, get thru security, taxi in the runway, fly, taxi in the runway, then rent a car. In contrast, when taking a train from Washington D.C. to New York, I found that train travel was faster than airlines and better integrated with public transportation. With high-speed rail, airline travel to cover a few hundred miles would never be a personal option. Travel between Washington D.C. and Boston is now even faster with speeds of up to 150 miles per hour on Amtrak’s Acela, the only high-speed rail in the United States. Now you can get from the nation’s capital to downtown Manhattan in less than three hours; an impossibility with airline travel and the fastest taxi driver in New York history. Over ten million passengers road this Northeast Corridor in 2007, making it the most popular train route in the U.S. Acela is now profitable. In 12 years, 32 to 68 million passengers may be riding on an even faster system in California. The high-speed rail will keep California’s economy moving forward, with more jobs, more energy security and far less emissions. The US Capitol to downtown Manhattan in three hours. Downtown San Francisco to downtown LA in 2.5 hours. These are travel times that airlines simply cannot match - once you factor in total travel time including the trip to and from the airport. Millions of Californians have stories such as this - whether it's of their travels on the Acela, the Shinkansen, the AVE, or like Fiona Ma, the TGV. While it certainly seems like the major political issues surrounding HSR will be financing and environmental impact, perhaps the most compelling and convincing arguments in its favor are those that come from personal experience. From Californians who know first-hand just how effective and valuable high speed rail really is. What these personal accounts make clear is that high speed rail is simply a better way to travel. It offers advantages that the airlines cannot, and has a brighter, more affordable future that the airlines cannot hope to offer. HSR isn't a dragon-slayer - it's not going to put the airline industry out of business overnight - and nor is that its goal. Instead it will offer modern transportation that meets our 21st century needs - from cost to economic growth to global warming. It’s starting to look like the wind is behind this thing, what with college students campaigning for it all over the state from now until November, when voters will have to decide whether they like the $10 billion bullet train bond measure or not. I’m still waiting to see what sort of borrowing plan Sacramento will cook up to get us through the current budget crunch. I get the sense, however, that even that won’t stop the bullet train measure from going before voters. Of course, we should see HSR funding and the state budget deficit as separate issues. The solution to our structural revenue shortfall involves new revenue sources and tax solutions, separate and apart from an infrastructure funding bond. And Californians can look at the Bay Bridge and Golden Gate Bridge and realize we built them with bonds in the depth of the Depression - and realize a fiscal and economic crisis is not a sufficient reason alone to not invest in a vital infrastructure project. Today we live in a world where Iran has gasoline riots, where the law of supply-and-demand has finally kicked in at California gas-n-gos and a lot of us know people who face death daily trying to keep one of our major oil suppliers from falling to pieces. But I don’t think it’s just me that pines for an alternative to driving-as-usual. The entire nation is talking about high speed rail. There are communities in Arkansas lobbying for Texas’ high-speed rail to come on by. It seems like every state with a major city has some sort of effort in the works, to say nothing of other nations, such as Morocco and India. What Nelson is coming to realize is that bond debt is not the beginning and the end of how we evaluate HSR. As gas prices soar, carbon emissions rise and global warming's impacts grow more severe, Californians realize instinctively that the cost of NOT building HSR is going to far outstrip whatever costs we will incur in constructing it. This is really the crucial point that has to be made again and again and again. The question here is not what HSR's cost alone is - it's instead what the cost of NOT building HSR will be for California. The CHSRA estimates expanding airports and freeways to meet the expected transportation demand that HSR would handle is $80 billion (as of 2004). Already Californians and their business are groaning under the weight of rising fuel prices - some experts think we could hit $200/bbl oil and $6 gas within three years. As these costs are expected to be rising and high for many years to come, California's economy is going to be crippled without a non-oil based alternative. And this doesn't even include the expected costs of carbon taxes or cap-and-trade carbon fees. I also had to do some soul searching to report the minutes of my typical commute. I wanted to say two hours, as I normally tell people. But that’s really just the normal train trip. From the time I leave my house to the time I arrive at work is really closer to 2:20. I’m not going to belabor my reasons for living way out in the Central Valley, other than I did it for love. But I am where I am, and that puts me on one of those pogo sticks, from a couple of perspectives, wearing one of those HSR t-shirts. Clearly, then, Nelson understands HSR is an excellent investment in our state's economy, energy independence, environment and climate, and quality of life. Hopefully Nelson will continue to see the value of HSR and properly understand its financing and how it compares to our other options - and let's hope that others in the corporate media follow his lead. It seemed appropriate to use Earth Day to remind ourselves of the environmental and climate benefits of the high speed rail project. While the finances of the project are getting the most discussion in the state's media, HSR is necessary if we are to have any hope of meeting the AB 32 carbon reduction goals and actually do something about global warming and pollution. Some might ask about the electricity generation for the HSR project. The CHSRA is currently undertaking a study of how to power the system with zero greenhouse gas emissions. Given the potential for thermal solar in the Central Valley and wind power in some of the mountain passes and the Delta, a carbon neutral high speed rail system is entirely possible. These facts are more than compelling. They demonstrate why high speed rail is an absolutely necessary part of California's solution to the great crisis of the 21st century - global warming and its effect on our environment. Although there are several other important reasons for HSR, on the environmental basis alone this project is something California cannot afford to reject. The San Francisco Chronicle weighs in today on the HSR proposal with an editorial that makes some very good points as well as some real headscratchers. Given how important this project is to San Francisco, the Chronicle's support is welcome, but it would be nice if they showed a better grasp of the project. Legislators were waiting for the perfect storm of budget solvency and economic growth, thinking that this might help the bond pass. Apparently they've realized that California's budget woes aren't going to get better before gas prices and global warming get worse: The bond measure should finally be on the ballot this November. It's good that the Chronicle agrees the bond measure should be on the ballot, but let's be clear why it wasn't on the ballot in 2004 or 2006 - Arnold Schwarzenegger didn't want it there, as it would have competed with his other bond priorities. If the governor had shown better leadership perhaps HSR bonds could have been enfolded within the 2006 infrastructure bonds - few seem to have batted an eye at $42 billion in bonds then, so what's another $10 billion going to hurt? Our skepticism about the rail measure remains. It's going to be an extraordinarily expensive project, with costs projected to be at least $40 billion. If it's not done right, it could be both environmentally degrading (it will pass through ecologically sensitive areas) and financially crippling (cost overruns seem inevitable) for the state of California. There have been successful examples of government-run high-speed rail projects (France), but there have been unsuccessful examples too (Japan). Unfortunately the Chronicle editorial doesn't note the far larger expense of doing nothing. $80 billion in airport and freeway expansion to handle the expected demand isn't exactly a better use of money than a $10 billion bond. The environmental damage from HSR construction is likely overstated (especially if the ROW hews close to Highway 152 in the Los Banos region, by far the most tricky part of the line). And while the Japanese Shinkansen system has gone through some reorganizations, it has been successfully operating HSR for over 40 years. Moreover, there are MANY more government-run HSR success stories - Spain, Germany, and Taiwan all have extremely successful government-run systems. The high stakes probably account for a great deal of the legislators' hesitation: No one wants to be responsible for a boondoggle. Still, with a troubled national airline system, $4-a-gallon gas, and even President Bush offering goals to combat climate change, the rail system is a risk we can't afford to not take. All of this is dead-on. While I do not believe HSR is nearly as risky as the Chronicle editors do, they are absolutely right that we cannot afford to not build this system. They do understand that rising gas prices are calling into question our state's reliance on freeways and airlines for intrastate travel - and the airlines are becoming more and more troubled (they're now skimping on fuel). And the Chronicle, unlike nearly every other media outlet that has recently assessed HSR, mentions climate change as a reason to build HSR. I have begun to wonder if HSR's critics even believe in global warming, so it's welcome to see one of the state's leading newspapers making the obvious link between HSR and action on the climate. Forty billion dollars would be a lot to ask from California taxpayers in good times; in a recession it doesn't seem politically feasible. Except that nobody is asking California taxpayers for $40 billion. Instead the bond plan is for $10 billion, and most of the remaining balance will likely be coming from the federal government, with private investors helping to finish out the overall project cost. Cost overruns are inevitable, especially in this era of rampant inflation and a collapsing dollar - but California voters are only being asked to pony up a quarter of the overall cost. Seems like a good deal to me. And California has already spent enough time hesitating over the rail system - we urge the governor to work with the Legislature to make the current proposal the best that it can be for the environment, the taxpayers, and those who will ride the rail in the future. I could not agree more strongly. The more we delay, the higher the cost will become, and the longer our state will be shackled to an obsolete and economically ruinous oil-based transportation system. Two of the leading figures in the high speed rail project have published op-eds in this week's issue of Capitol Weekly: Quentin Kopp, chairman of the California High Speed Rail Authority's board, and Jim Costa, Democratic Congressman from the 20th district (Fresno). The short-term and long-term economic impacts of a high-speed rail system would be tremendous for California's economy. Construction of the system is estimated to generate almost 300,000 jobs. Following construction, the system will provide 450,000 permanent jobs in California. These jobs will have a huge ripple effect into other areas of California's economy, such as the service and manufacturing industries. Overall, for every dollar invested in this system, we will see two dollars in return. Any Californian who travels more than fifty miles to work, or who travels for pleasure will tell you they would love a headache and traffic-free route to their destination. Whether flying from Los Angeles to San Francisco, driving back and forth from the Inland Empire to San Diego, or commuting from the Central Valley to the Bay Area, drive and fly times can total four or five hours of travel time. High speed rail can not only cut these travel times significantly, but ease the grind of congestion Californians have while traveling in-state by car or air. The "for every dollar invested we will see two dollars in return" figure is interesting, and while I'd love to see the origin of that claim, the overall concept that this project will produce economic growth well beyond the initial investment is clearly true, whatever the actual figures turn out to be. It would make travel within the state easier, especially as rising gas prices and peak oil begin to price more and more Californians out of intrastate travel. And the immediate economic impact of the system is considerable. California's unemployment rate now stands at 6.2% and rising, having soared a stunning 0.5% in March alone. 300,000 construction jobs would be a significant economic stimulus, especially considering how hard hit the state's construction industry has been by the housing market collapse. From Earth Day to the Environmental Quality Act, California has always been known as a leader in pioneering environmental protections. But with air pollution worsening, we've lost ground. Electric high-speed trains will restore our leadership role in the "green" movement. High-speed trains will eliminate nearly 18 billion pounds of the greenhouse gas emissions that cause global warming each year. That's equivalent to removing more than one million vehicles from our roads annually. They will also reduce dependence on foreign oil by up to 22 million barrels per year. As populations continue to increase, high-speed trains are constitute a key pillar in local efforts to clean up what has become some of the nation's dirtiest air. Statewide, California's population will rise to 50 million people in 20 years. These numbers are, to me, just as considerable as the jobs figures discussed above. Living six blocks from Monterey Bay, I'm acutely aware of the impact of global warming on California's cities. Concern over rising sea levels is already forcing Bay Area planning agencies to prepare to relocate residents and businesses when the bay starts rising. The economic benefits of reducing dependence on foreign oil should be obvious to anyone who has filled up a gas tank lately. And the reduction in carbon emissions is also important, given that by 2018 Californians will almost certainly be paying some form of carbon fees - whether an outright carbon tax or passed-on costs from a cap-and-trade system - every time they drive and fly, making HSR an even more competitive and affordable alternative. It seems that these will be the four pillars of the official HSR campaign this fall - congestion relief, job creation/economic growth, system profitability, and environmental benefits. Personally I would consider emphasizing the costs of oil-based transportation as well, but then public awareness of peak oil is still depressingly low (there's an idea for your next movie, Al Gore). Given the economic and environmental concerns that are at the top of Californians' list of priorities, however, the approach Kopp and Costa are taking makes a great deal of political sense. Feds Ready to Drop Big Money on HSR - But Will the Sierra Club Block It? The current issue of Capitol Weekly is full of HSR material, including columns from Quentin Kopp and US Rep. Jim Costa in favor of the project. We'll get to those tomorrow, but of more immediate interest is this article by Anthony York on recent political developments surrounding our HSR plan. A delegation of state high-speed rail board members recently went back to Washington D.C. seeking an answer to that very question. And the answers, according to Crane, were encouraging. State officials say they have received indications from members of Congress that there will be roughly $60 billion set aside for high-speed rail projects nationwide in next year's federal transportation bill. And they are further encouraged that California, which is further along than any other state in its high-speed rail development, is well positioned to capture some of that money. But, said Crane, "it will require a strongly unified and aggressive California Congressional Delegation" to capture some of those funds for the state high-speed rail program. $60 billion is a pretty stunning number. The CHSRA has been aggressive in pursuing it - a major reason for having chosen the Pacheco alignment was that California members of Congress pressured the Authority to choose it. And given that no other HSR project in the country is anywhere close to being as developed as ours, it bodes well for the project finances. Of course, this is dependent on a Democrat winning the White House, as John McCain is a noted train hater. It's also dependent on the California environmentalist community. Their support for HSR would seem to be a no-brainer - it would get millions of Californians out of their cars and planes, would provide dramatic carbon emissions reductions, and would kick off a national trend of moving toward sustainable, renewable, environmentally friendly transportation solutions. Reversing the American dependence on pollution-spewing transport would seem to be a holy grail for environmental activists - it sure is for me. Meanwhile, some environmental opposition remains. The Sierra Club's Tim Frank said that while his group is encouraged by the decision not to build a rail station in those protected grasslands between Gilroy and Merced, his group still has concerns with the project. "High-speed rail will be growth-inducing in the Central Valley," said Frank. "The question is, will it be good growth or bad growth?" Frank said he wants to give the High-Speed Rail Authority some say over land use decisions as the Central Valley continues to grow. "Now is the time when we have some leverage," Frank said. I am as strong an anti-sprawl advocate as you are likely to find on the internets. But the Sierra Club is barking up the wrong tree here. They are defining themselves as an exclusively anti-growth organization, even at the expense of transformative action on global warming and pollution. Sprawl needs to be ended in the Central Valley. But we also have to realize that sprawl is NOT a force of nature. It is instead a product of three major factors: cheap oil, cheap credit, and favorable land use laws. The first is disappearing for good, thanks to peak oil. The second doesn't exist now, and may never return. As a result the Central Valley is now the world leader in foreclosures. Certainly land use policies will need to change there, as they must statewide. But why should HSR alone carry that burden? AB 32 carbon reduction goals should be applied to new housing developments, and ultimately, localities will have to change their ways. Unfortunately the Sierra Club has been attacking electric rail transportation more and more of late. In Seattle, where I lived from 2001 to 2007, the Sierra Club joined with right-wingers to successfully kill a ballot measure to provide a 70-mile expansion of the region's light rail system. The plan was unfortunately linked to an expansion of local roads, but the Sierra Club's opposition included the flawed charges that the light rail stations would have induced sprawl in suburban Seattle (flawed because Washington State's Growth Management Act would have prevented most sprawl). The Sierra Club promised to support a rail-only ballot measure in Seattle in 2008, but so far that support has so far been withheld. The bill makes one major concession to environmentalists, explicitly stating that there will be no rail station in Los Banos. Environmental groups including the Sierra Club opposed the Los Banos station, saying it would damage protected grasslands in the Central Valley. I agree that there was no compelling need for a Los Banos station. And the Sierra Club can play a valuable role in ensuring that the Pacheco Pass route is designed and built with maximum respect for the surrounding landscape. But especially with the Los Banos change, the Sierra Club would be well-advised to declare victory and join us in supporting one of the most environmentally necessary and useful projects this state has ever considered. Especially when there is up to $60 billion waiting for us in DC. Reid scoffed at DeMint’s advocacy of a competing, private company’s plans for a regular train between Las Vegas and the Antelope Valley, in the desert some 85 miles northeast of downtown Los Angeles. Reid questioned whether tourists would drive through the traffic of Los Angeles to Victorville to take a train the last 200 miles. President Bush signaled he is not pleased in what he sees as extra spending in the bill. What we're seeing is an attack on efforts to do something about our transportation, energy, and environmental crisis in the name of fiscal conservatism. HSR opponents realize they won't win by attacking the system's merits, so they trot out "pork" and "subsidy" in hopes they can scare voters and Senators into opposing HSR on those grounds. They would prefer we did nothing and saved a few bucks today instead of spending some money now to save us from greater costs and problems in the future. The irony is that much of the transportation system we use on a daily basis is the product of earmarks and subsidies. And the desire to hold down government spending will accomplish little other than the worsening of the transportation/energy/environmental crisis. By not spending money now, we will face a far higher cost down the line of dealing with peak oil, global warming, and collapsed infrastructure. It is an inherently short-term view that puts immediate savings over long-term investment - sacrifice the future for the sake of the present. Is $45 million really too much for the US Senate to handle? We spend that much in one second in Iraq. Surely it can be spent on America's own economic future. Last year Eurostar opened a new high speed line connecting the Channel Tunnel to St. Pancras station in London - a faster, more central connection linking London to Paris than had previously existed. As a result ridership has soared by 21% - and as the Wired Autopia post notes, Eurostar's ontime record of 93% easily beat that of low-cost air carrier easyJet. Eurostar connects London to Paris in 2 hours 15 minutes - about 15 minutes less than the projected SF-LA trip. In Taiwan, 23 million people have traveled on the country's HSR service in the first 15 months of operation. A China Airlines subsidiary, Mandarin Airlines, had to terminate its service between Taichung and Taipei because it failed to compete with the HSR system. Here in the USA, the quasi-HSR Acela service has now taken 41% of the market share on the Northeast Corridor. And ridership on Amtrak California's intercity lines continues to soar. Meanwhile rising fuel costs are driving up airline fares, causing four airlines to go bankrupt in the last two weeks, and forcing Delta and Northwest to merge to cut costs. Of course, HSR's opponents would have us believe that somehow California is unique - that HSR's global success won't happen here, that air travel's national struggles won't affect "cheap fares" here. Unless these critics have some secret method to cure peak oil and reverse rising fuel costs, Californians should not take them seriously. The BayRail Alliance is hosting a talk this Thursday on Carbon Neutral Rail Service in Mountain View. David Dearborn is a San José native who has worked out a tentative plan to power Caltrain entirely by solar power. Presumably the technology and practice of the system can be applied to high speed rail as well - perhaps mixed with wind power, which the California High Speed Rail Authority has been promoting in its advertisements. Already there are plans to include some form of "hybrid" technology by which the HSR trains would restore power to the grid when braking, but to maximize the environmental and climate benefits of HSR it would be ideal to have the system entirely powered by renewables. I won't be able to attend the meeting, but I recommend it and the BayRail Alliance to you all; hopefully someone can go and report back to us. Also, as you may have noticed, I'm not an expert on the engineering and tech aspects of HSR - but feel free to use this as an open thread to discuss such things. The California High-Speed Rail Authority Board yesterday authorized a study to determine the feasibility of achieving zero greenhouse gas emissions for the power needs of the 700-mile electric high-speed train system. The study, timed to be completed by June of this year, will focus on costs, potential location of facilities and partnerships with utilities for on-site production of clean energy sources. "The proposed route of the system intersects with many of the state's best location for wind, solar and geothermal facilities," said Quentin Kopp, chairman of the Authority. "High-speed trains will help California meet the goals set out by the state to reduce greenhouse gas emissions; using new clean energy technologies to power the system will be an added bonus and establish California as a leader in reducing global warming while developing renewable energy sources." 138,211 passengers +16.8% vs. 2007, another record for the month, and the second highest ridership month for the service. Californians not only will ride trains, they ARE riding trains. These numbers have been steadily rising for a couple years now. And this is on trains that have a top speed of about 70 mph, on tracks shared with UP freight trains. What this shows is that train demand in this state is significant. Give those riders a fast train that runs on its own tracks with a stellar on-time rating (the Shinkansen and the AVE trains are rarely ever late) and the trains will be full. How long will HSR opponents try and deny the facts? "The whole definition of 'commuter' is changing," says Mehdi Morshed, executive director of the California High-Speed Rail Authority. "The old model is people going to factory jobs from 8 to 5 … now people are driving 150 miles from one place to another two to three times a week for work, recreation, travel, once-a-week meetings – this generation is changing, and so will the next." Now, it seems to me that this change took place about 30 years ago. But Morshed's point is that our state's transportation systems haven't caught up, and that HSR is needed to match it. It's an interesting angle - BART has become an all-day, multidirectional transit system and Metrolink is moving in that direction. HSR would supplement that with much faster speeds along some of those routes. Will this be enough to convince voters? It always seemed to me that HSR as intercity travel was the strongest pull, but perhaps I'm wrong. What do you think? Is HSR as commuter travel - in the Mehdi Morshed sense - going to be what gets us a bond measure win this November? It’s hard to calculate the value that a project like this would have in the long run, in the same sense that it was hard to calculate the value of some of the first railroads, highways and major bridges in this state. High speed rail really does need to be assessed in those kinds of terms. It would be a transformative project for this state, catalyzing economic development in ways that are difficult to quantify. HSR would play a central role in 21st century prosperity in California as the aqueducts did in the 20th century and the railroads did in the 19th century. The train would help Silicon Valley to become more accessible to lower-income and middle-income workers who can no longer afford to live here, people who instead live in Central Valley cities like Stockton or Modesto and spend hours driving back and forth to work in the Bay each day. The planned network includes a series of stops in Central Valley towns. For some this sets off "sprawl" alarm bells - but I don't see the cause for concern. Sprawl is a product of cheap oil, cheap credit, and favorable land use rules. We're losing the first two. Stockton and Modesto, in fact, bear the highest foreclosure rates anywhere in the *world* right now. As gas prices continue to soar there will be even less appetite for sprawl - but a lot MORE appetite for high-density development in close proximity to an HSR station. I'm all in favor of tightening the land use rules against sprawl too, but HSR alone isn't going to destroy the Valley. In fact it is likely to be its salvation. The blog post goes on to mention environmental benefits, jobs, and convenience as reasons to get behind the HSR plan. Plus they link to the Facebook group and to this blog - but that's just icing on an excellent argument for HSR. After attending the California High Speed Rail Authority board meeting for the month of April last week, I lost a lot of faith in our state government and their managing of the High Speed Rail project. The meeting accomplished very little, and most of the time allocated for the meeting was spent by board members Curt Pringle and Kirk Lindsey arguing fiercely in opposition to smart growth, transit oriented development (TOD), and public funding of the project. The meeting got off to a somewhat late start and was introduced by co-Chairwoman Fran Flores, as Chairman Quentin Kopp arrived late to the meeting. She brought up a current assembly bill AB3034 related to the high speed rail project. AB3034 will be set for committee hearing on April 14th at 1pm. At the Governor's request, the assembly bill will work to address issues of fiscal responsibility by allowing for a possible public-private partnership for the rail project--likely forfeiting State control of the project to corporate investors. Other than approving the minutes of the previous meeting and bringing up the issues of AB3034, there was not much else accomplished at this board meeting. Most of the time was occupied by the heated arguing of Curt Pringle and Kirk Lindsey with the other members of the board. After doing some research on these two individuals I learned that they were both appointed to the board in 2007 by Governor Schwarzenegger. Curt Pringle, currently the Mayor of Anaheim, is also a registered lobbyist who has lobbied for several companies that have conflicting interests with the HSR project. I was shocked to learn that while he has lobbied for the oil company Atlantic Richfield and Company, also known as ARCO, Governor Schwarzenegger felt that he was a qualified person to serve on the board of the High Speed Rail project--a project that will significantly reduce our oil consumption. If this doesn't scream conflict of interest I don't know what does. Mayor Pringle was formerly the Speaker of the California State Assembly, the last Republican to hold that position. He and the Orange County Republican Party were sued after he was narrowly elected to the California State Assembly in the election of 1988 for hiring security guards to intimidate Latino voters at polling locations across the county. The guards dressed in uniform with signs in both Spanish and English informed voters that "illegal-immigrants" would not be allowed to vote in this election. He and the Orange County Republican Party paid a settlement of $400,000 dollars to the plaintiffs, 5 Latino voters and the Orange County Democratic Party. Despite all of this, Curt Pringle was hand picked by Governor Schwarzenegger to be a voting member of the California High Speed Rail Authority. From his presentation and attitude at the meeting it seems as if he will fight hard to keep this project from going anywhere soon unless he can stop the board from forcing cities to implement TOD and smart growth plans and force the project to be privately financed. Despite opposition to project plans from within the board, there were a few positive announcements and accomplishments made at the meeting. According to the board, if we pass the bond measure this fall and immediately start working on the project, they predict all segments and corridors of the project will be complete by 2020. The Deputy Director of the project, Dan Leavitt, made an impressive visual presentation showing the entire rail system and the design, location, and style of all of the proposed stations. The video footage he presented should be available to the public within the next few weeks and I would suggest that anyone interested in California HSR watch it. It will be available on the http://www.cahighspeedrail.ca.gov/ website. Other speakers at the meeting included the Visalia's Mayor Jesus Gamboa, a representative from the Sacramento Area Council of Governments (SACOG) discussing Sacramento's progress in smart growth and TOD to prepare for a HSR station, and a student from Sacramento City College informing the board of CalPIRG's recent Spring Break event to promote High Speed Rail. Mayor Gamboa addressed the board about his City's desire to be included as a stop in the HSR network. He shared the City's efforts to promote smart growth, transit oriented development and their overwhelming desire to have a high speed rail station. Specifically Mayor Gamboa said, "Visalia has been promoting smart growth and transit oriented development for a long time." He also mentioned that many people in the Tulare-Kings County Area would benefit from access to a station in their area. The representative from SACOG praised the practices of smart growth and emphasized the connection between land-use and transportation planning. He continued with, "Sacramento has worked hard to address sprawl. We are worried though about sprawl and development practices around the [high speed rail] stations." He suggested that a transit oriented development plan or TOD plan be implemented in the areas surrounding all of the proposed stations. The meeting concluded with public comment. However, public comment was very limited and restricted and no response was offered to the comments that I had made nor to any of the comments made by others who spoke. Hopefully at the next meeting more concerned citizens will speak up to the board. The next board meeting will be held at 10am on May 7th, the location is TBD in Sacramento. The committee hearing for AB3034 is set for April 14th at 1pm in Room 4202 at the State Capitol and is open to the public. The text of AB3034 can be downloaded here: http://files.statesurge.com/file/194986. Ryan Loney contributed to this report. He can be contacted at raloney@ucdavis.edu. Example: After we've railroaded our children's educational future to make up for our government's inability to mind its financial P's and Q's, we will be given the opportunity to go on yet another spending spree ---- a $10 billion bond for building high-speed rail service from San Diego to San Francisco. Mind you, that's only about a quarter of the estimated $42 billion cost of Stage 1. Another $10 billion is said to be gathering dust in our federal piggy bank just waiting to be shipped to California to get the government ante up to $20 billion. The balance is to come from a private partnership and/or ---- surprise! ---- a special tax. It is career-threatening to describe in a family publication just how truly special that bit of pickpocketing would be. As is typical for a conservative, Strickland lays the blame for our state's unspecific financial crisis at the feet of "government." But the specifics matter. We face a structural revenue shortfall - meaning California routinely takes in much less money than it needs to pay its bills. This is the product not only of 1978's Prop 13, but more immediately of some $12 billion in tax cuts made during flush economic times since 1993. Half of that sum - $6.1 billion - comes from the 1998 cutting of the Vehicle License Fee, a cut which Gray Davis planned to reverse and Arnold Schwarzenegger preserved as his first act in office. That VLF - which would cost the average Californian about $150 a year - would if restored eliminate the proposed education, health care, and state parks cuts. So why should HSR suffer for the state's unwillingness to balance its books by getting realistic about revenue? Of course, as I have noted here before, the state has spent bond money on massive infrastructure projects in the middle of tough financial times before. Both the Golden Gate and Bay Bridges were built with public bond money during the depths of the Depression. They were invaluable economic stimulus projects, putting thousands of people to work at a time when the state desperately needed new jobs. Our situation today is not much different. And since the bond would be repaid from fares once the system opened, it is highly doubtful that the public is going to be on the hook for this. But even if the public were, would that be such a bad thing? HSR is a necessary project, for reasons of the environment, energy, and the economy. As has been pointed out more than once, high-speed rail north to south is not a necessity. What we need is regional rail and, given the money being thrown at highways, it could become reality with far less fiscal pain than continuing to pour and repour concrete to no effect. The November HSR bond provides $950 million for regional rail. But to say that "high-speed rail north to south is not a necessity" is just an ignorant thing to say. As we have discussed repeatedly here, the era of cheap is coming to an end, and with it the ability to easily fly and drive between the two halves of our state. California's economy depends on north-south travel, and high speed rail is the only solution to that transportation need that can actually survive here in the 21st century. HSR would also itself serve as "regional rail," connecting SD to Temecula, Riverside, and LA; connecting the South Bay to San Francisco; Orange County to LA. But, even given the tack of creating regional systems that actually benefit the payee and linking them by high speed as needed, the state of our affairs dictates that this hardly is the time to be borrowing $10 billion for darn near anything. Actually, this is precisely the time to be borrowing $10 billion for high speed rail. Bonds have been used to pay for infrastructure projects for over a hundred years in this state. Their beauty is that they do not need to be immediately repaid in full, but can be repaid by the infrastructure project itself upon completion. The bay bridges and the State Water Project both functioned in exactly this manner. And the need for HSR is immediate. Not just as economic stimulus, but as a transportation solution. Airlines are beginning to drop like flies - three went bankrupt last week and several more are right behind them. The price of oil is showing no limit in sight, and the onset of peak oil, which will cripple supplies, marches relentlessly closer. If we allow an unrelated fiscal issue to stop HSR in 2008, it's going to take years to revive the project's momentum. In that time Californians will suffer as their oil-based transportation systems begin to come apart. 2008 may not be the ideal year to propose HSR to voters, but it has to happen sometime. Since it won't break the budget - a budget that can be easily fixed with a few simple revenue solutions - HSR is something we should all support so that California doesn't face an even greater fiscal and economic crisis in the future. It looks like high speed rail in California is starting to get more attention - especially from conservative op-ed writers. Last week I examined why Dan Walters' HSR ideas were so flawed. And now Republican legislators are getting in on the HSR-doubter act. Jim Battin is a Republican State Senator representing the 37th district (Riverside County), and last week published an op-ed in The Desert Sun titled "High-speed rail plan off-track". As Sen. Battin just returned from the Japan HSR trip, it's a more interesting piece than Walters', but it also repeats many of the same basic flaws - particularly a myopia about the continued availability of cheap oil-based travel. Below I deconstruct Sen. Battin's flawed arguments. I know The Desert Sun disapproves, but I recently spent a week in Japan leading a bipartisan delegation that met government officials and studied the country's high-speed rail system. In November, Californians will be asked to approve our own high-speed rail project. From what I saw, firsthand, taxpayers need to approach the idea with great caution. High-speed rail works in Japan because of the country's geographical uniqueness and the smart government policy decisions. The country is roughly the size of California, but has four times the number of people, 80 percent of whom are located in major urban centers. And according to the latest figures some 97.7% of Californians live in an urban setting. Not all of them live in the state's "major urban centers" but well above 50% do, living in close proximity to the proposed HSR line. Japan's geography is not all that different from California. The two main differences are that Japan is an island nation, and does not have anything like our massive Central Valley. But like Japan, most California urban areas are located along coastal plains and valleys, hemmed in on several sides by mountain ranges. This actually creates fairly natural corridors for HSR. In the 1980s, Japan National Railways was a public sector failure, running a yearly operating deficit, with a huge debt, declining ridership, high fares, and poor service. Japan broke up the public sector monopoly and created private, passenger-rail companies to serve different areas of the country and compete for the consumer's yen. The three companies serving the most urban areas operate with no government assistance. One way they do this is by owning the key real estate around train stations, allowing the rail companies to operate retail centers that offset the cost of service. This should be balanced out by noting that SNCF and RENFE, the French and Spanish public sector railways respectively, are both public sector successes. Ridership continues to climb on both countries' HSR systems. And they DO provide "competition" - not with each other, but with the airlines that serve the same corridors. In both countries they are competing with a great deal of success. As to owning the real estate around the stations and building transit-oriented development (TOD), that appears to be a central part of the California HSR plan. From my own experience, it is clear the Japanese "Shinkansen," or bullet train, model has been a success. Private-sector efficiencies reduced costs, while rail fares remained stable. The trains, operating at up to 186 mph, are clean, safe and service is readily available. Consumers responded by increasing ridership more than 20 percent. Still, the service is not cheap. The line fare from Tokyo to Osaka, which at 251 miles is a little shorter then from Los Angeles to San Francisco, costs 13,200 yen, or about $130 one way. In contrast, Californians can find a flight from LAX to SFO on Southwest Airlines as low as $39 one way, and Southwest gets a traveler there in half the time. It is good that he recognizes the success of Japanese HSR, but he then goes on to make probably the greatest possible error one can make while assessing HSR - assuming that present travel conditions will continue indefinitely into the future. They won't. Does Sen. Battin really want us to believe that Southwest will be able to offer $39 flights for much longer? As one of our commenters explained, those super-cheap fares are not the usual price a traveler pays for a one-way trip. And even the more accurate $65 figure is not long for this world. As oil prices continue to soar and peak oil puts the squeeze on fuel supplies, airlines will have no other choice but to raise fares. Last week rising fuel costs put three airlines out of business - Aloha, ATA, and Skybus. And the remaining carriers are feeling pinched too, as they increase fares, fees, and fuel surcharges while passenger numbers continue to decline. We cannot use "cheap, fast Southwest airlines" as a reason to not build HSR because there is a very good chance that neither they nor any other carrier will be able to offer cheap fares for much longer. And it only takes "half the time" to fly as opposed to take HSR if you don't count the actual travel time involved with flying, including travel time to the airport, check-in, security, etc. When all that is factored in, HSR is about even with flying. The plan itself has been a boondoggle even before voters have their say. The Legislature initially placed the bond on the 2004 ballot, but then moved it from one election to the other trying to "time" when both the state budget and economy were healthy. While waiting for that electoral magic, taxpayers have spent millions to fund a California High Speed Rail Authority that has had no rail to build. That isn't a "boondoggle." The CHSRA has had very modest funding, which they have used to develop a solid plan that voters will evaluate this fall. The only person responsible for the two delays of the HSR vote has been Arnold, who didn't want it on the ballot in 2004 or in 2006, when his other infrastructure bonds were facing voters. To call this a "boondoggle" is to misuse the term. The $9 billion bond gets the rail line started, but the authority estimates the total capital cost for the project at a staggering $25 billion, a figure definitely lowballed. To put this in perspective, each Californian will spend about $715 dollars, almost $3,000 per family of four, to subsidize high-speed rail. That's before they even get a chance to buy a ticket. And the 9/11 airline bailout was $15 billion alone, which doesn't include over $5 billion in other annual subsidies to the US airline industry. Yet Sen. Battin never discusses those kind of subsidies, nor the tens of billions in annual road subsidies spent here in California. For Sen. Battin, like most conservatives, somehow only passenger trains are seen as getting subsidies; all other forms of transportation somehow magically prosper all on their own. The fact is that transportation has always been subsidized in America, ever since New York spent $25 million to dig the Erie Canal in 1825. Given the size of this country it cannot be any other way. Instead of unfairly and unrealistically attacking the existence of subsidies, Sen. Battin should be asking whether these subsidies will reap value for Californians. In the case of HSR, they will. Of course there is no guarantee the rail service will be profitable. The proposal anticipates one-way fares set at only $55 in the year 2018 - a ridiculous presumption by a bureaucrat trying to "sell" the bond. Given Amtrak's sorry pattern of taxpayer bailouts, and Japan's own history with high-speed rail, government is bad at operating rail lines best run by the private sector. This $3,000 subsidy will be the beginning of what California families will pay and pay and pay. Of course, Sen. Battin gives us no reason why the $55 fare is "ridiculous." Nor does he explain the rather important point that the "$3,000 subsidy" wouldn't come all at once, but would instead be spread out over many decades. And there's no guarantee any of us would have to pay it. European HSR systems - which he routinely ignores - repeatedly turn an operating surplus, which can be used to pay off the bonds. Nor does Sen. Battin provide this with any context. Even if every Californian would have to pay a $3,000 subsidy for HSR over 30 years, that pales in comparison to what Californians would have to pay over that time in plane fares, gallons of gas, airport expansion costs, and freeway widening and maintenance costs. Sen. Battin makes one of the common errors of HSR critics - assuming the project exists outside of any real-world context. Of course, only government subsidies kept the major carriers in business the last 7 years, which suggests a rather major flaw in Sen. Battin's anti-public sector subsidy argument. Amtrak is routinely made to do much more with much less than their airline counterparts get - and still they've taken nearly half the market share from the airlines on the Northeast Corridor. Battin closes his article claiming to welcome the greater use of public-private partnerships (P3) in HSR but says that isn't enough to back the plan: "Right now, this proposal is not a rail we should be riding." But since his own arguments are so full of holes, flaws, and inconsistencies, I don't think Californians should feel any hesitation about HSR based on Sen. Battin's ideas. It's a shame more California Republicans don't grasp the actual issues and realities of HSR. But as the polls continue to suggest, neither are California voters buying what the Republicans are selling on HSR. Still recovering from my illness, which was apparently a kind of bronchitis, so I may not be back up to my daily posting schedule until the middle of next week. In the meantime I wanted to share a great op-ed published in yesterday's Sacramento Bee, Toll road bad news is high speed rail good news. It's written by Michael Dukakis, the Democratic presidential candidate in 1988 and now a public policy lecturer at UCLA, and Arthur Purcell, an LA land use analyst. What the commission really said is that if close to $1 billion is available to build this project, let's use it on projects that will deliver more bang for the buck, reduce environmental impacts and energy use, and make a real dent in the highway congestion that plagues Orange County and most of California. And that means high-speed rail. The $1 billion its sponsors wanted to spend on a toll road could go a long way toward paying for the cost of that portion of the state's high-speed rail plan that could take travelers from Los Angeles to San Diego in 55 minutes and from Irvine to either of those cities in less than a half-hour while eliminating a lot of congestion on Interstate 5, not only in Orange County but along the entire route. Now, I'm not entirely certain about these travel times. I hope the authors realize that, due to the unstable bluffs along the Coast Line near San Clemente, HSR is going to follow CA-91 and I-15 from LA to SD. But it would still be much faster than any toll-road aided trip would be, especially as the toll road would not serve the main population centers of Orange County at all. And don't let anybody tell you that Californians won't ride the trains if they are fast, safe and efficient. Amtrak's Pacific Surfliner from Los Angeles to San Diego is the second most popular train in the entire Amtrak system and carries more than 2.5 million people a year. Imagine how many people a high-speed train connecting those two cities would carry with a running time of less than an hour – one third of what it currently takes on the Surfliner and less than half the time it takes to drive it, even on a good day. I think this is a very good way to combat the "Californians won't ride trains!" nonsense. Not only is the Pacific Surfliner a VERY popular train, its ridership has been steadily rising since 2002 - as has ridership on the other Amtrak California lines, as well as local mass transit systems. Californians already ARE riding trains and in growing numbers. The creates demand for HSR, which makes those train trips faster and therefore more popular. Poll after poll tells us that reducing congestion and doing something about global warming are at the top of Californians' concerns about their quality of life. Building new freeways and expanding old ones is a last-century approach that will do neither. And with gasoline now hitting $4 a gallon, it's pretty obvious that California's long-standing love affair with the automobile is on the rocks. This is another great point as well. As you've seen in some of the comment threads, the "quality of life" aspect of HSR is repeatedly cited as one of its major attractions. And it's not hard to see why. Californians love their cars, but that love affair has become a bitter and loveless marriage to gridlocked freeways and soaring gas prices. I know people who drive 580 over Altamont Pass every morning, and the 91 through the Santa Ana Canyon, and the 14 down from Palmdale - and they all hate their commutes, longing instead for a faster, cheaper option. The proposed high-speed rail bond issue that will be on the ballot in November will carry an estimated cost of $9 billion. It would be matched by the federal government with a contribution that is less than the cost of a month of the Iraq war. And it could be supplemented by billions in contributions by major investors in development around the system's stations. The $3 trillion we have spent in Iraq to no good purpose would have built a LOT of high speed rail. If a Democrat wins the White House this fall it seems likely that the federal government will contribute a significant amount of money to this project, greatly leveraging our state's $9 billion investment. The bond issue is a small price to pay for a high-speed rail plan that will create thousands of jobs, reduce congestion on our highways and at our airports, cut pollution and global warming, help revitalize the state's older cities, preserve our parks for generations to come and save us a lot of pain at the pump. It ought to be one of California's top priorities. They are right about all of it. For all those reasons above, I firmly believe high speed rail is the most important project this state has considered in the last 50 years. Where the State Water Project of 1960 laid the foundation for the last 48 years of growth, HSR will do the same for the next century.